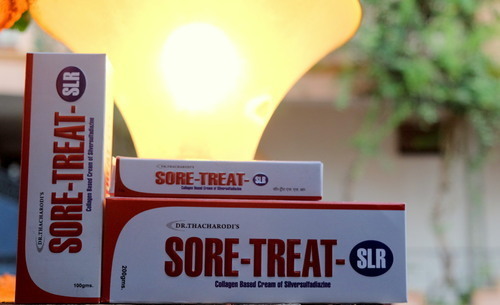 Sore Treat SLR is India’s first film forming bovine collagen based cream of Silversulfadiazine. It is a self- setting semisolid of Type-I collagen that contains Silversulfadiazine [1% w/w]. It is devoid of any fatty substances or alcohol, purely water soluble and forms a thin layer of collagen on superficial areas when applied and left free. To start with the therapy apply daily for 3-4 days, thereafter on alternative days only. Helix Pharma [Innovators on collagen] was founded in 2004 by Dr.Thacharodi with a clear vision that make available value added research oriented collagen based products in India. It is situated in Pondicherry. We introduced our pioneer product Sore-Treat (Collagen based cream of Silver sulfadiazine) followed by Xenoderm (Collagen Dry Sheet). Today we manufacture and market many collagen based products all over India. Our main brands are 1. SORE TREAT SLR [ Collagen based cream of silversulfadiazene], 2. SORE TREAT GTN [ Collagen based cream of gentamicin], 3. XENODERM [Collagen dry sheet], 4. XENODERM-WT [Collagen wet sheet], 5. XENODERM-WTM [Collagen wet sheet meshed], 6. BIOSEAL [Ccollagen particles], 7. XENOSTAT [ Collagen-alginate sheets]Our products have made entry into various prestigious institutions all over India.